“We both paid $3500 for our engagement rings in the same store on the same day, and the resell value on my ring is significantly less than the other.” – the best hypothetical situation I could come up with to explain why this could happen. 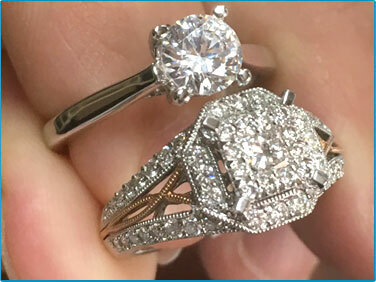 One of the rings in the photo here is a .75ct center solitaire diamond, the other has a .30ct center with intricate diamonds set around the ring. And it’s true that both rings do retail for $3500. When buying an engagement ring, it’s important to note the cost of production. This “production” value is what it takes to make a ring, this is applicable for a custom-made ring or even a ring that is built with many melee diamonds (small diamonds) in the ring itself. It takes time, effort and money to make those pieces, whether it’s the incredible art of hand carving a wax just for you alone or having someone sit there and install each of those little tiny diamonds all over the ring, that labor certainly has some costs. This isn’t a bad thing to have in a ring, it certainly makes it more special to the wearer, it’s actually breathtaking when paired with an awesome center diamond. 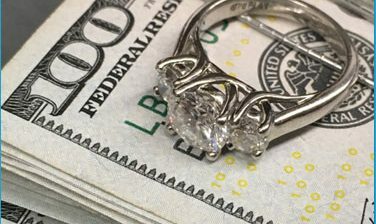 Now when jewelry buyers, diamond buyers or even pawn shops consider purchasing a ring, 9 times out of 10, they disregard the production value. They are basing the value of the quote on the center diamond. This is because these buyers have a typical plan to remove all of the diamonds and melt down the rings. When we offer to purchase an diamond out of an engagement ring, rather than tell someone that we only pay for the materials of the ring, we offer to install a CZ and send it back as a non-live mounting. Our general plan is to purchase the ring and sell the diamond as an “estate diamond” and put it a brand new mounting of the customer’s choice. So to a diamond buyer, a $3500 ring that features a lot of intricate work wouldn’t have quite the same value as a $3500 simple ring with large center stone. 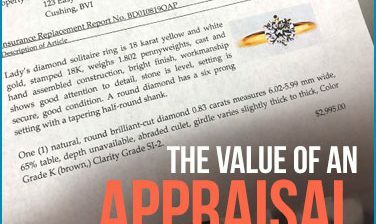 It certainly doesn’t mean that the value isn’t there for the first piece, it’s just that a diamond buyer may not be the best place to sell it. The only way to maximize a return on the production value of pre-owned in engagement ring is by really selling it directly to another end consumer (private buyer) that plans to wear it (or plans to give it to someone to wear). If you have ring where most of the value was invested into the production of the ring instead of the center diamond, selling it to end consumer or private buyer is really the best option for attempting to get your money back out of the piece. There are pros and cons in doing this. The “pro” by selling a ring to a private buyer can be worth it financially. Individuals that plan to wear the ring will often take into consideration the production value of a piece and pay a higher price for that. 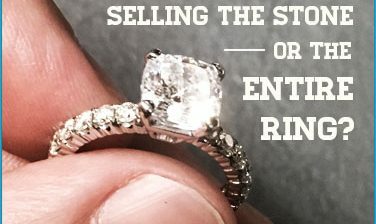 One “con” in selling a ring this way is that it takes time to find the right buyer, it could take months. The other “con” is no matter how the exchange goes, the seller seems to always be on the hook if a stone falls out or if something isn’t as the buyer expected. Those are two scenarios that if you can overcome, certainly make it worth trying. Another idea that we’ve seen work many times and we’ve mentioned this before, if the center stone is at least .75ct single stone and the mounting has a high amount of production value, there may be another path to really maximize the value. We’ve found that selling the ring as a whole can cause the seller to lose a little value on the stone, or on the mounting. It’s the idea of package “deal” when you really could separate them and yield better on both individually. We have bought a significant amount of diamonds and sent back rings to the seller as the a non-live mounting with a CZ (just for looks). This enables the seller to sell a mounting (that someone falls in love with) for low price giving them the ability to go and purchase a diamond to have installed that really fits their budget.